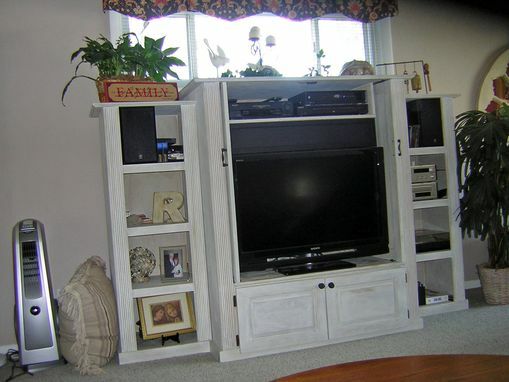 This painted entertainment center provides room for a 37" TV along with all of the other household media devices. The TV and most components sit behind doors which fold into the cabinet. The open side towers provide space for other devices and speakers, as well shelves to display pictures or other items. It serves multipurposes in a compact design. Dimensions: Overall dimensions are @ 6' w X 4' h X 2' dp.